We’re racing again this week! This weeks course will take us through the upper woods and crevices of Brighton. 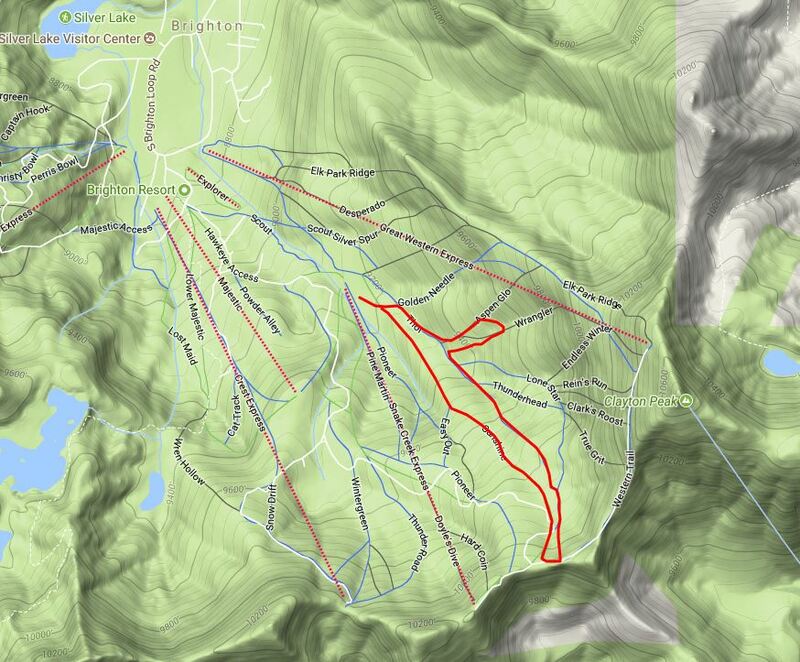 We will start at the bottom of the snake creek lift and travel up a short ways with a quick transition and descent. Then more climbing up through the woods. A short booter and the jr’s turn off there. Then there is more skinning through the bumps to another booter which will have you top out at snake creek pass. A fun easy descent down the ski run will see you back to the start. If your feeling good and strong you will head up for lap 2. If your toast then thats the race for you. Things to plan on: Make sure you sign both waivers online at home before you come up. You can also pay for the night or your annual membership at home and online as well on the Utah skimo.org website. We do take cash at the registration tent too for the single race. Registration is at the bottom of great western and the start is going to be at least a 15min skin/warm up, so don’t hit check in at 6:55pm and think you will make the official start. You must check in at the registration tent BEFORE racing, even if you have signed your waivers and paid. I would highly recommend a pack to carry skis for the booters, but not required. After we will be inside at Alpine Rose for awards and raffle. Remember to show our gratitude to brighton and have beverage or some food. Previous PostRace #2 DetailsNext PostIt’s Race Week!